A basic glossary of terms used in environmental law, regulation and policy in Australia is available here. A PDF of the glossary with a summary of underlying theories and assumptions for environmental regulation and policy in Australia is available here. 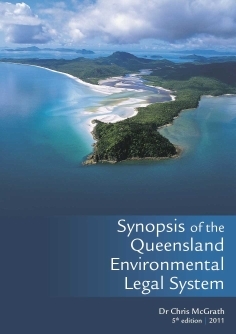 Chris McGrath, Synopsis of the Queensland Environmental Legal System (5th ed, Environmental Law Publishing, Brisbane, 2011). Diagram of the major pieces of the Queensland Environmental Legal System (as at 21 February 2011). Chris McGrath, Major environmental impact assessment (EIA) processes in Queensland (Environmental Law Publishing, Brisbane, 2011). Chris McGrath, Treaty interpretation basics (Environmental Law Publishing, Brisbane, 2011). Chris McGrath, Statutory Interpretation Basics for Non-Lawyers in Australia (Environmental Law Publishing, Brisbane, 2010). Chris McGrath, Surreal Economic Debate on Climate Change (Environmental Law Publishing, Brisbane, 2008). Chris McGrath, Synopsis of the Queensland Environmental Legal System (3rd ed, Environmental Law Publishing, Brisbane, 2004). 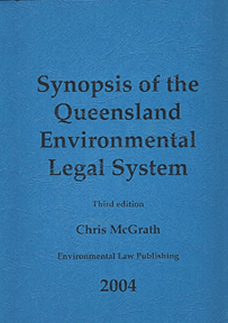 Chris McGrath, Synopsis of the Queensland Environmental Legal System (2nd ed, Environmental Law Publishing, Brisbane, 2003). Chris McGrath, "Opposition plan to surrender environmental approvals a messy backward step" (The Conversation, 29 June 2013). Chris McGrath, "Regulating water: debate swirls around Commonwealth's role" (The Conversation, 20 May 2013). Chris McGrath, "A reef under siege" Australian Geographic, March-April 2013. Chris McGrath, "Australia coy in report on heritage status of Great Barrier Reef" (The Conversation, 4 February 2013). Chris McGrath, "Sydney Harbour's toxic legacy shows value of green safety net"
(The Conversation, 17 December 2012). Chris McGrath, "Mending holes in the green safety net" (Precedent, November/December 2012). Chris McGrath, "Australia's scramble egg of government: who has the environmental power?" (The Conversation, 5 December 2012). Chris McGrath, "Energy White Paper plans to burn, burn, burn it all" (The Conversation, 9 November 2012). Kat Grigg and Chris McGrath, "Scales of justice tipping against the community in Queensland" (The Conversation, 6 November 2012). Chris McGrath, "Are we deliberately destroying the Great Barrier Reef?" (Crikey, 5 October 2012). Chris McGrath, "Federal 'green-tape' myth for Alpha Coal Mine" (The Conversation, 6 June 2012). Chris McGrath, "Carbon tax is politically astute but profoundly inadequate" (The Conversation, 14 July 2011). Chris McGrath, "Access to climate research data ordered" (The Conversation, 6 July 2011). 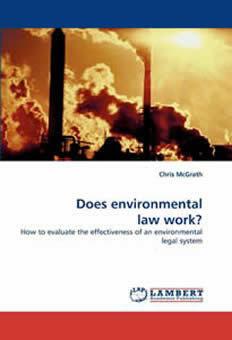 Chris McGrath, Does environmental law work? How to evaluate the effective the effectiveness of an environmental legal system (Lambert Academic Publishing, Saarbrücken, 2010). Chris McGrath, "Emissions pathway to return global warming beneath 1 degree Celsius" (Climate Shifts, 21 January 2009). Chris McGrath, "Appreciating the immense timescales of climate change and ocean acidification" (Climate Shifts, 15 November 2008). Chris McGrath, "Avoiding confusion for stabilization targets for climate change and ocean acidification" (Climate Shifts, 4 November 2008). Chris McGrath, "Will we leave the Great Barrier Reef for our children?" (Climate Shifts, 28 October 2008). Chris McGrath, "Flying foxes, dams and whales: Using federal environmental laws in the public interest" (2008) 25 EPLJ 324. 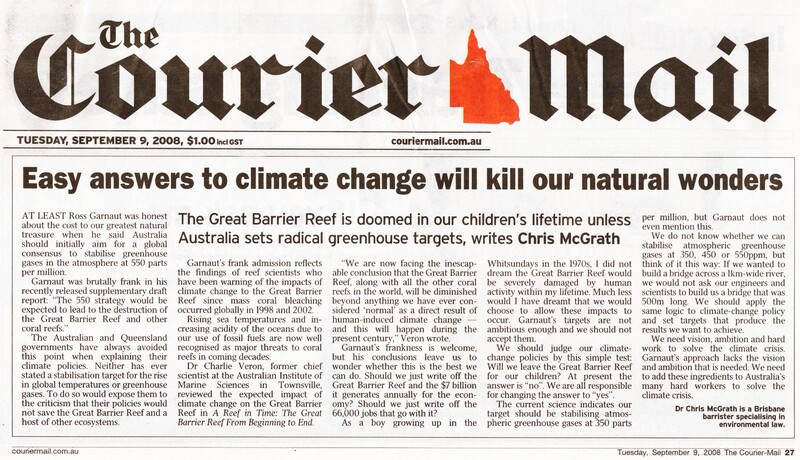 Chris McGrath, "Will we leave the Great Barrier Reef for our children?" (IUCN Alexandre Kiss Award for Environmental Law Research, Bonn, 2008). Chris McGrath, "Easy answers to climate change will kill our natural wonders" (Courier Mail, Brisbane, 9 September 2008). Chris McGrath, "Time is running out" (Townsville Bulletin, 16 April 2008), reproduced with permission of the Townsville Bulletin. Chris McGrath, "How to evaluate the effectiveness of an environmental legal system" (PhD thesis, Queensland University of Technology, Brisbane, 2007). Chris McGrath, “Review of the EPBC Act”, paper prepared for the 2006 Australian State of the Environment Committee (Department of the Environment and Heritage, Canberra, 2006).